"Hope is something we all need." Hey, I'm Jayden, and I'm a 17-year-old senior in high school. My friend Jesse and I play on the same football team, and have seen a lot of things together. I met Jesse in 6th grade, in a lunch line at school. I was short 25 cents and he gave it to me, without me knowing him. Ever since then we've been best friends. I asked Jesse to do this project with me because he's already 18 - old enough to vote. Jayden Stevens & Jesse Shiluli, Director: Esther de Rothschild, Camera: Sebastian Diaz & Irina Khoklova, Sound: Frank Flaherty, Editor: Naje Lataillade, Score: Henrique Eisenmann, Mix: Austin Kase, Thank You: Sally Wangwe & Carmen Ortiz! 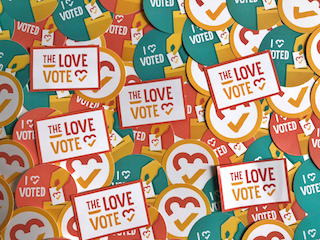 Show Jayden love + inspire others + get voting info + get event invites + get stickers + create change!